Palestinian farmers from Yatta village south of Hebron in the West Bank have revealed that the Israeli military continues to bury nuclear waste in their farmlands at Al-Masafer near the armistice line in the West Bank. The farmers said that the military forces "IDF" brings trucks loaded with waste suspected to be radioactive waste and is burying it in their lands after they force them to evacuate the area. The farmers said that they were able to hide themselves in some caves and watch the military operation. They stated that the Israeli soldiers who declared the area as a military zone were wearing white overalls over their military uniforms during the burial. The farmers said that they live in Al-Masafer with their animals. 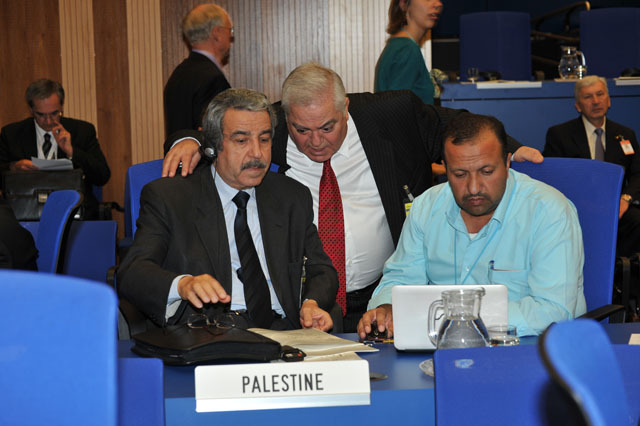 Two days ago Dr. Zuheir Al-Wazeer, the Palestinian Ambassador in Vienna, exposed another scandal at the 54 General Conference of the IAEA. He said: "I would like to point out that Israel did not deliver to us the equipment of the agency in the field of technical cooperation. The IAEA sent us this equipment as part of a technical exchange program, but Israel still holds this equipment and has not released them since over two years". After the conference I was informed by Dr. Al-Wazeer that IAEA equipment which was sent to Palestine two years ago is still under the Israeli embargo. The equipment consists of devices used to detect radiation pollution. According to my information, the IAEA did not work enough or ask the general assembly members to impose pressure on Israel to release this equipment under the Israeli hold and which will help the Palestinian ministry of health in identifying areas of radioactive contamination in Palestine. 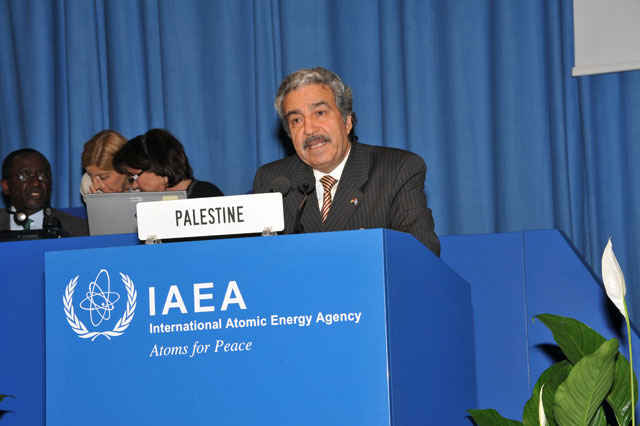 Ambassador Dr. Alwazer said in his speech delivered at the IAEA: I assure you that we are facing the danger of the Israeli nuclear weapon. Palestine suffers a significant risk of radiation because of Israel�s possession of nuclear reactors including the Dimona reactor, which has ended its useful life, which will expose Palestine and the Palestinian people and neighboring countries to the serious dangers of radiation. We look forward in this regard to the functions of the IAEA in order to study this matter and take the necessary means in order to avoid a health disaster. Yatta village south of Hebron in the West Bank where the Israeli military continues to bury nuclear waste. That the Palestinian issue is the core conflict in the Middle East and remains without a just and comprehensive solution based on international security council resolutions, particularly resolution 194 and the establishment of an independent Palestinian State with its eternal capital in Jerusalem, and without the implementation of right the of return, there will be no peace, security or stability in the Middle East region. Comment: That israel would not hand over the IAEA equipment to measure radiation has its grounds. Israel buries nuclear waste near Palestinian towns across the West Bank as a part of its program of genocide and ethnic cleansing against Palestinians, what has caused a sharp increase in cases of cancer and other ailments resulting from radiation exposure. Sites where it is known for sure that the israelis bury nuclear waste are Masafer near Yatta, and Daharieh, but there are also other places. Below is a summary of the other statements which were delivered by several representatives of European, Western and Arab countries at the 54th General Conference of the International Atomic Energy Agency (IAEA) held in Vienna 20-24 September 2010. In these statements the double standards of application of the NPT safeguards for nuclear weapons in the Middle East, Korea and Iran are clearly displayed. Regarding the Middle East, the NPT parties accepted the importance of a process leading to full implementation of the 1995 Resolution, reinforced by concrete and substantive practical steps, including the convening of a conference in 2012. We believe that discussion of the Middle East issues at this General Conference should aim to contribute to advancing implementation of the 1995 resolution, and that we must avoid actions that can damage the atmosphere created by the agreement in New York, and undermine work toward the conference in 2012. (Click on the pictures to see them bigger). 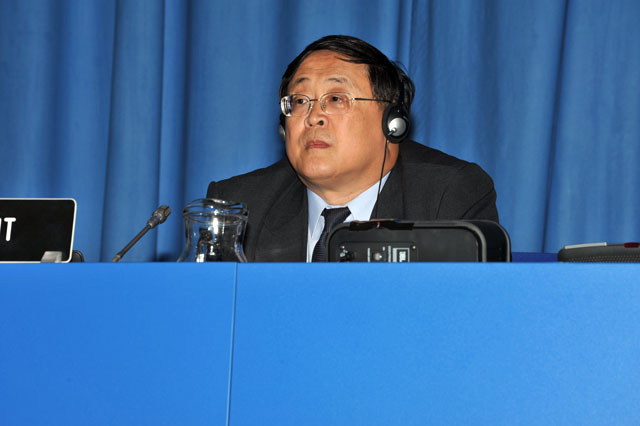 Regarding DPRK (Democratic People�s Republic of Korea), The DPRK must comply unconditionally and without delay with its international obligations under United Nations Security Council resolutions and its Safeguards Agreement, and resume full cooperation with the IAEA. We call upon the DPRK to return to the Six-Party Talk immediately and without preconditions. We urge the DPRK to abandon and completely dismantle any nuclear weapons-related programme in a transparent and irreversible manner. Regarding Iran, the Agency remains unable to confirm that all nuclear material is in peaceful activities because Iran is not providing the necessary cooperation remains a matter of ongoing serious concern to my government. Iran should take steps towards the full implementation of its Comprehensive Safeguards Agreement and subsidiary arrangement, as well as relevant Resolutions of the Board of Governors and the UN Security Council, and proactively work to clarify activities with a possible military dimension. We call of Iran to cooperate fully with the Agency and to implement the Additional Protocol without delay. NPT: As a strong supporter of NPT, New Zealand endorses the principle that nuclear technology should be available for peaceful uses in conformity with Article II and III of the treaty. 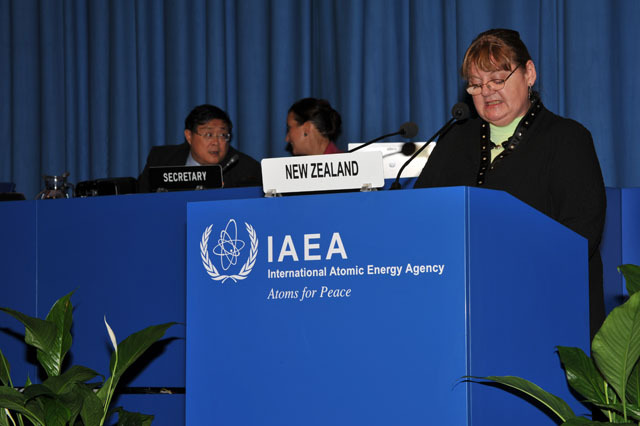 Terrorists: New Zealand shares the assessment that the possibility of terrorists obtaining nuclear or other radioactive material remains a grave threat. Fir this reason it is of paramount importance to maintain stringent standers of physical protection for nuclear material and nuclear facilities. DPRK: New Zealand condemns the nuclear tests conducted by the DPRK as well as its refusal to comply with the UN Security Council resolutions and cooperate with IAEA inspectors. We urge North Korea to refrain from further destabilizing acts and to refocus its efforts towards peace and dialogue, including its Six Party Talk commitment to abandon its existing nuclear programme. Middle East: An important outcome of the review conference was the reaffirmation of the 1995 Resolution on the Middle East and the agreement to convene a conference in 1012 on the establishment of a zone free of nuclear weapons and all other mass destruction in the region. New Zealand calls on Syria to be more cooperative and transparent in its provision to the Agency of information about, and access to the Dair Alzour site and other related locations. We also encourage Syria to cooperate fully with the Agency on the outstanding issues at the Miniature Neutron Source Reactor in Damascus. An important outcome of the review conference was the reaffirmation of the 1995 Resolution on the Middle East and the agreement to convene a conference in 1012 on the establishment of a zone free of nuclear weapons and all other mass destruction in the region. Continue to strengthen cooperation for sustainable development of the nuclear energy. Continue to foster nuclear safty and nuclear security capability building of member states, and to enhance efficiency and effectiveness of nuclear safeguards. Play an active role in addressing sensitive and hot-spot nuclear issues. DPRK & Iran: As the intergovernmental international organization responsible for nuclear safeguards, the Agency attracted lots of attention from the International community for its efforts in addressing hot-spot nuclear issues. China always holds that the Korean Peninsula nuclear issue and Iranian issue should be peacefully resolved through dialogues and negotiation, and supports the Agency and the director General to continue to play due roles to push forward diplomatic settlement of the issues. It should be noted that Jordan and the United Arab Emirates were elected by acclamation as members of the IAEA�s board of governors for the coming two years. 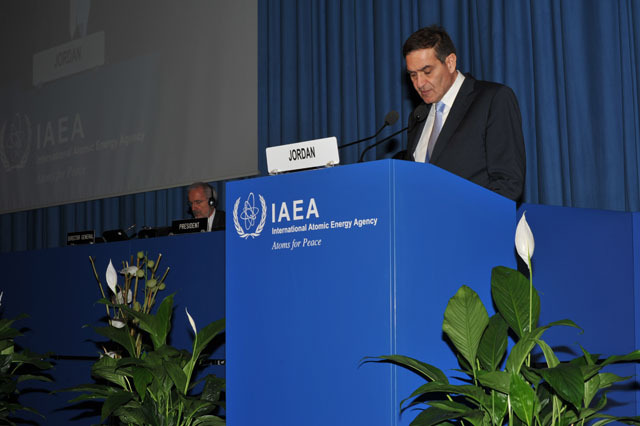 The statement of Jordan was delivered by Makram Queisi, ambassador of Jordan to Austria, He said that the Jordanian Kingdom stresses the need for Israel to join the Treaty on the NPT and to subject all its nuclear facilities to IAEA safeguards to achieve universality of the treaty in the region and a zone free of nuclear weapons in the Middle East, which will lead to peace and security and to turn the incentive of the countries in the region to focus on economic and social development of peoples instead of the nuclear arms race, which exacerbate tensions and threats to the security in the region. The Republic of Yemen: The statement of the republic of Yemen was delivered by Ambassador Abdul El-Hakim Abed al- Rahman al-Iryani, Permanent Representative of the republic of Yemen to the IAEA. 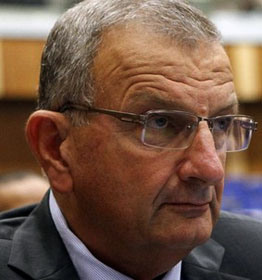 He said: At the time while all Arab states joined the NPT treaty on the Non-Proliferation of Nuclear Weapons, Israel continues to defy the international community by refusing to permanently join the NPT and to subject its nuclear facilities under comprehensive safeguards agreements to the IAEA, and continues its refusal to all international initiatives aimed achieving universal NPT adherence in the Middle East. The Israeli refusal has led the region into a nuclear arms race. Austria: The Austrian statement was delivered by Johaness Kyrle, Secretary General, and Austrian Federal Ministry for European and International Affairs. Terrorists: IN recent years, the security of nuclear and other radioactive material has become a priority concern. There is International consensus about the need to strengthen the security of nuclear and other radioactive material in use, storage and transport, and to protect them and associated facilities against terrorist and other malevolent. Because radiation knows no frontiers, States need to recognize that the security of nuclear material and facilities is a legitimate concern of all States. Countries must continue to demonstrate, not only to their populations, but to their neighbors and the world that strong security systems are in place. Therefore, it is important to repeat that call on all States parties to the Convention on Physical Protection of Nuclear Material to also ratify the amendment, which substantially strengthens this convention. Regrettably, the agenda of the General Conference is occupied by the anti-Israeli Items submitted with a clear purpose, to avoid discussion of serious violations of the NPT and safeguards obligations by states in the Middle East. I am therefore obliged to focus my address on these severe and most urgent topics. Recently the conference witnessed continuous ill-motivated effort to single out and to condemn the state of israel. Not surprisingly, there is much similarity between those countries that are in the forefront of attacking the state of israel, and the Middle Eastern violators of the NPT and the IAEA safeguards agreements. I wish to remind all delegates that four Middle Eastern member States, parties to the NPT, namely, Iran, Syria, Libya, and Iraq under Saddam Hussien, have grossly violated their tries obligations. 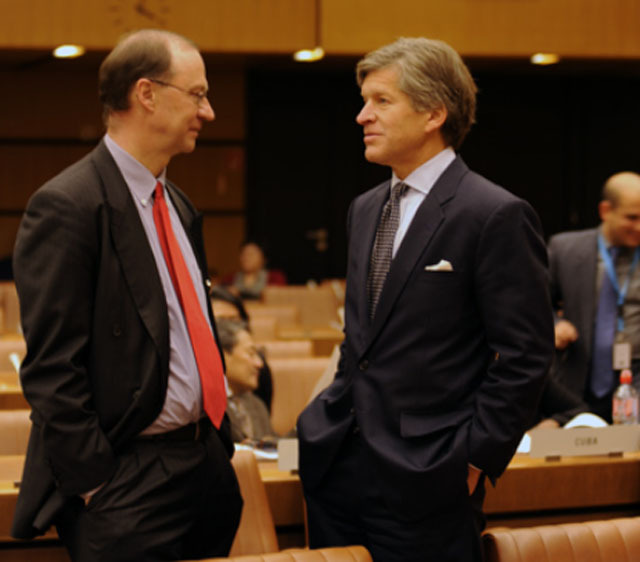 What is an Iraeli delegation doing at an IAEA meeting anyway? They repeatedly refuse to participate in the treaty, and express contempt for all who think they should. Israel should have its UN membership revoked, and any "diplomats" sent back to Tel Aviv, since Israel never complies with UN resolutions anyway. This reader has it right. Israel has shown without exception in all its dealings that it does not have the ability to contract, so it is sensible to ask why everybody wants to make Israel join into one of the most important international treaties, the NPT, when everybody concerned should know for certain that Israel will turn around to violate and insult the letter and spirit of the NPT, and boast about it, as soon as they accede to it, whenever that happens. The IAEA and the NPT are very important forums of all nations, central to world peace, and allowing Israel into the NPT would only increase the dangers to world peace. Iran: with regard to Iran, we share the serious concern expressed in a succession of reports by the IAEA director general regarding the failure of Iran to extend the cooperation to the Agency that would be necessary to allow it to confirm that all nuclear material in Iran is in peaceful activities and to dispel doubts about possible military dimensions of its nuclear programme. We urge Iran to comply fully with all resolutions of the Security Council, the Board of Governors and with its safeguards agreement. Middle East: Denmark also shares the IAEA�s concern about Syria�s failure to cooperate with the Agency to an extent that would allow the agency to make progress toward resolving outstanding issues surrounding the peaceful nature of Syria�s nuclear programme. We join the director general in urging Syria to bring into force an additional protocol in order to facilitate the work of the Agency to verify the completeness and correctness of Syria�s declaration. 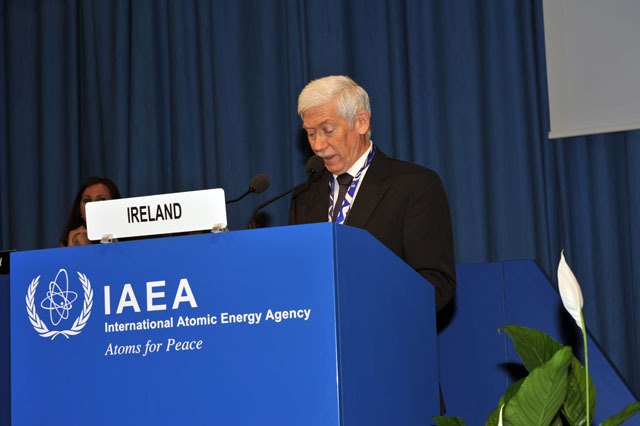 Australia: The statement of Australia was delivered by Ambassador Michael Potts, head of the Australian delegation to the IAEA. Iran continues to act in violation of binding UN council resolutions and the IAEA Board requirements. We remain deeply concerned that Iran is not providing the IAEA with full cooperation on it�s on its investigations especially with respect to the possible military dimensions of its nuclear program. North Korea continues to be in non-compliance with its safeguards obligations and to act in defiance of the UN Security Council resolutions, Australia continues to urge North Korea to abandon its nuclear weapons in a complete, Verifiable and irreversible manner, and to comply with its NPT and IAEA safeguards obligations. Middle East: Australia has long supported the establishment of a Middle East zone free of nuclear weapons and other weapons of mass destruction. Full compliance with their non-proliferation obligations by all states in the Middle East is critical to building mutual confidence and security in the region. We continue support the Agency�s effort to engage Syria to clarify a number of unresolved issues about it�s nuclear activities, including the construction of a nuclear reactor with north Korean assistance. Comment: In view of this, it must be noted that various delegations mentioned "terrorism", generally smearing Arab countries, and also the israeli delegation said that the voting down of the Arab draft proposal helped "prevent terrorism" or something along those lines. The resistance against the illegal jewish invasion, genocide and ethnic cleansing of Palestine is wholly legal under UN laws and the Geneva Conventions. The terrorists are clearly and in every case of violence since the 1880s, the European jewish invaders. I equally find it astonishing that an israeli among the delegation insulted ALL Arab countries of being "Khudspan" (impudent and shameless) while giving a comment. "Khudspan" is a hebrew word which ONLY use to describe impudent and shameless. The word was turned to another meaning during the translation. Regarding terrorism experimented daily by the world starts with the reckless insults and threats proffered by Israelis. And facts make it clear that the actual terrorists are Israel and its allies. We Palestinians know this better than anyone.